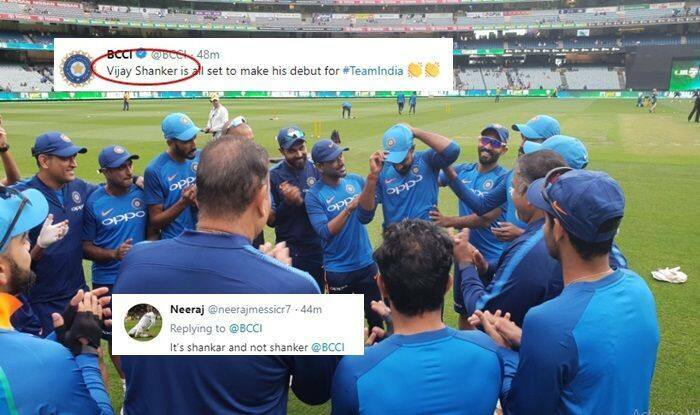 3rd ODI India vs Australia Melbourne: BCCI got the spelling of ODI debutant Vijay Shankar wrong. They made a spelling error and wrote his name as 'Shanker'. 3rd ODI India vs Australia Melbourne: BCCI got the spelling of ODI debutant Vijay Shankar wrong. They made a spelling error and wrote his name as ‘Shanker’. It was one netizen who spotted it and made sure he notified. The Tamil Nadu-born cricketer received his cap ahead of the all-important decider at Melbourne Cricket Ground and social sphere is already having doubts over his selection. Here is how a netizen spotted the error. The 27-year-old has already made his T20I debut last year in the Nidahas Trophy. With the series square at 1-1, Kohli has made three changes in the team for the decider. Siraj makes way for Vijay Shankar, Chahal for Kuldeep, Jadhav for Rayudu. It is quite surprising that Kohli has made so many changes to a winning combination, but he has made it clear that with not many games to go for the World Cup, he is willing to try all permutation-combinations. Meanwhile, India has won the toss and opted to bowl first looking at the overhead conditions where rain is a threat for the day.